Hey guys, Matthew Weiss here, www.weiss-sound.com, www.theproaudiofiles.com. I am still in the dark because I still have not changed this light bulb. I swear to god it’s not because I’m lazy, it’s because I have very tall ceilings — which are great for acoustics and terrible for changing light bulbs. Anyway, not important because the focus is on the sound, not on the visual effects. That’s my excuse. Anyway, I’m gonna play you a little bit of a record here. So I’ve played the record right at the start of a section change and what I’m gonna show you how — what I did — was how I created a transition effect that wasn’t there. So I grabbed this sound effect right here. I don’t even know where I go that in the song. There’s like some pitched vocals and I grabbed a pitched vocal and I put some effects on it. The first one is called MondoMod. MondoMod is sort of a crazy little effect where you can kind of change the amplitude and frequency through modulation and it sounds like this. So it gives it that warbily weird character. Ok, but we don’t stop there. Then I’m throwing on this D-Verb plugin and we get this. Ok, getting weirder. Now, I’m gonna try and bring out the tail of the D-Verb using a compressor. Notice how you hear the trail of the “ooooh” a little bit more. 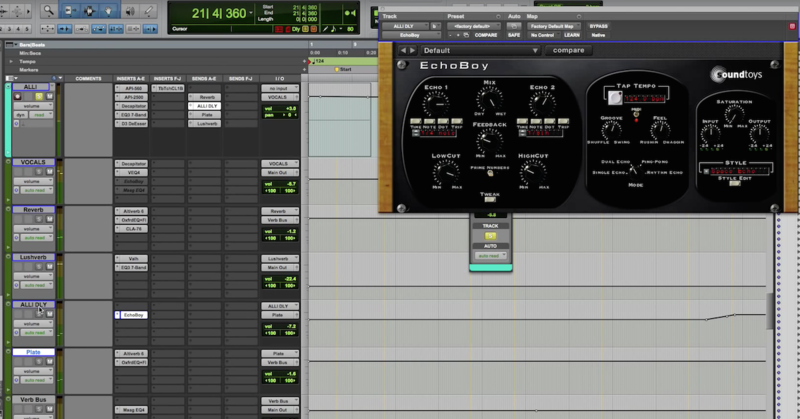 Now we’re throwing on some EQ just rolling off that low end. And lastly throwing on an imaging plugin to make it really wide. So it covers the whole space. Now is that the end of it? Nope. I’m doing one last thing. Let me turn off this little trim thing and turn on our volume automation. And I’m automating the volume to come way up right before the transition point and then drawing it down so that it fades out. And it sounds like this. So it kind of works like a riser in a way but it’s a little more ghostly and ethereal. Alright, hope you guys learned something, I sure did. Anyway, ’til next time.